Our weather in “the valley of the sun” is quite different from the rest of the country. We have two main growing seasons. The first is mid-February until the end of May and the second is September to mid-November. January is really considered the only winter month in the Phoenix area. As a result, care for your existing plants, shrubs and trees require little maintenance except to spray your dormant shrubs with water, prune your roses and deciduous trees (which are trees that lose their leaves seasonally, a tree that is shedding its leaves) and watch out for freeze warnings. This is also your last chance to plant shrubs and trees with bare roots or summer bulbs. Vegetables that can be planted include asparagus, carrots and lettuce along with potatoes or strawberries. 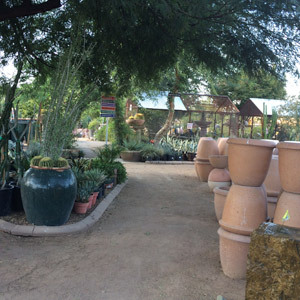 Green Goddess is known for its huge selection of hardscaping items such as tables, statues and fountains. If you are looking for a custom item in any of these products it can take 10-12 weeks to arrive which brings us to March or April when your spring designing starts. Along with these items, Green Goddess has hundreds of pots and earthstones in many different sizes and colors to fit all your needs. We are open 7 days a week to assist you with all your gardening needs. Don’t forget we also offer custom landscaping ideas and designs. Allow one of our talented and experienced landscape artists to come to your house to design your dream exterior or interior. Interior plant-scaping design has grown in popularity over the years. Green Goddess is a leader in this field. Allow us to turn your home or office into a natural tranquil environment. With our over 3 acre facility, over 40 years of experience, Green Goddess Nursery and Foliage Company has the expertise and knowledge to satisfy any of your landscaping needs. Please visit our facility and feel free to ask our qualified staff any of your gardening questions.